It deserves its place in the market, and we can imagine quite a few guitarists choosing it as their new stomping ground. Well built. Extremely portable. Practical for just about any application. Not entirely convinced that it needs to be floor-based. These days, amps come in a variety of shapes and sizes, but rarely do we confuse them with effects pedals and Robot Wars contestants. 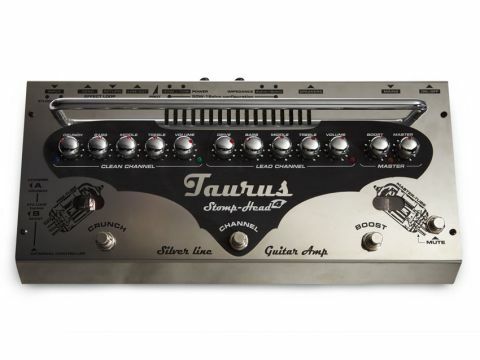 The Taurus Stomp Head is different, though, packing a roaring, fully featured, 70-watt high-gain amp into a rugged and compact floor-based enclosure. "This is a roaring 70-watt amp in a floor-based enclosure"
It may be diddy (see the specs), but Taurus hasn't skimped on features or connectivity. Along with the usual inputs, effects loop and speaker outputs, there's also a speaker-emulated line out for recording, 40/70-watt selector switch and stage/studio switch. In stage mode, the amplifier runs at full volume (either 40 or 70 watts), but in studio mode, the power is 10 times lower, perfect for cranking at home or recording. Each channel has its own 12AX7 in the preamp stage and a dedicated EQ, and the clean channel also has its own crunch mode, which, in itself, is almost a third channel. There's also a boost switch on the right-hand side, which not only serves as a volume boost for both channels, but also adds a layer of gain and harmonic complexity to the lead channel. This added punch functions even if the boost's volume is set to zero, so you don't necessarily have to force a massive jump in volume to enjoy the extra oomph. The clean channel itself is chimey and clear as a bell. With loads of headroom, it's ideal for pristine cleans that can still keep up with the rest of the band. At its lower settings, the crunch mode comes in at just the right level, adding a bit of grit to the clean tones, but also offering enough saturation at its highest point to cover just about any low-to- medium-gain genre. Chords ring out with clarity and balance, while lead passages are nicely touch- responsive, if not quite as detailed and dynamic as an all-valve head. Treading on the lead channel has the potential to unleash a tidal wave of distortion. There's enough gain to get the kind of huge, low-end response required for down-tuned and extended range guitars, but the gain range is wide enough to dial back the madness if you want to keep away from metal territory. The extra gain dialled in from the boost switch is also extremely useful, and gives you yet another texture to switch in mid- song, without having to alter any of your amp's settings. While there is a difference between the Stomp Head and an all-valve amp, it's still far away from a solid-state experience, and we've been left seriously impressed. That said, did the amp really need to be shrunk down into a floor pedal? We can't help but worry that the Stomp Head is one bad accident away from reminding us why we leave our amps well out of the way, but there's no denying that this head is well built, extremely portable and practical for just about any application.